Aliens have always been a topic of discussion among people, whether is about their existence, how to use them in movies or it’s regarding creating some killer design with great concept. The device which I am going to show you, has been the reaped fruit of time a same discussion and I am happy that it has been made. 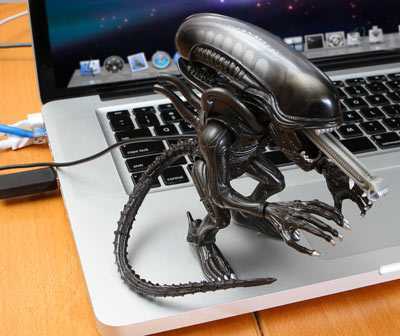 This is the cool and killer “Alien USB Collectible” which is surely going to light up your day. These Japanese people have every idea how to change the character of one thing and present it in a totally different manner. Though it’s the replica of the Big Chap but this USB light up Alien is really in very tiny version and measuring of just nine inches with an one meter long USB cable, which is sufficient to reach down to the plug point from your computer tower or docking station. Its function like this, every so often it will open the mouth and gleaming with an immoral red flush and the inner mouth will extend out to frighten you of your death and this process would go on with random gaps. Though it’s a smaller version, it is just as accurate but a miniature one of the big one of the movies, and really evil in its own way. Anyway this collectible is too attractive to keep at your working desktop or in one corner of the top of your key board which is available with a price tag of $39.99 . Even I want to draw your attention for some of such USB collectibles like Darth Vader & R2D2 USB Hubs or Predator Mask like Alien collectibles, which will really increase the magnitude of your show case or desktop.